I just finished a week in which I came in contact with several seemingly intelligent persons who simply, IMHO, did not get it. These folks are successful, upstanding citizens who prefer to believe that things economically, in America, couldn't be better. Now I realize that I am in Dallas, Texas and, because of the tax base provided by the Barnett Shale and contributing industry, things are not as dire here as they are in many parts of the country. The gentlemen that I was debating were also not part of the majority of Americans that are, in one way or another, on the Federal dole. It also had yet to occur to them that they were members of an endangered species which is, almost exclusively, made up of white, middle class men. They also refuse t realize how fragile their situations are being, almost entirely, dependent on the level of the stock market and the value of the dollar. Not one had any precious metals in their portfolios. I spend most of my time researching the markets and trying to "separate the bran from the chaff." The evidence of criminal misconduct by everyone from the Administration to the Security and Exchange Commission, is overwhelming. When searching for signs of honest politics, one generally come up empty handed. When searching for signs of honest banking, the results are even more dismal. And yet, the populace is intent on listening to elitest puppet Pollyannas who sing the recovery lullaby. Those taking the optimistic view here argue that our economic engine has been running hard to pull us out of the hole we've been in for the past five years. And now that we're back on level track, the engine's built-up head of steam is going to move us forward quickly. Expect better GDP growth, lower unemployment, higher income, high stock prices, higher housing prices, more innovation, and lower energy prices. If this future comes to pass, you won't want to be left in the dust as the party roars past. Get on the train – go long, perhaps with some leverage, and bet on America's grit and ingenuity. To be frank, this has been the winning side for the past year and a half. Those who have sided with the bulls have been rewarded with sizable stock gains and stabilized (or growing) housing prices. But if, on the other hand, you – like me – find enough reason in the data for doubting the optimistic case, you need to determine what your defensive plan should be. The degree of defense you adopt should be based upon your own exploration of the data. Dig further than the samples I could only cursorily provide above. Come up with your own personal assessment of the probability and severity of the downside risks. Exchange paper assets for tangible ones. Acquire exposure to the precious metals; we recommend having at least 10% of your net worth in gold and silver (for those new to owning precious metals, you may want to read our buyer's guide). Above that, if possible, invest in productive hard assets. Holdings like farmland, timberland, energy deposits, and mineral/water rights are assets that will produce units that will generate an income for you. Find a sympatico adviser to manage any remaining paper wealth. For many reasons, most of us will still keep a percentage of our wealth in the stock and bond markets (in retirement/pension accounts, 529 plans, etc). If you're in the defensive camp, make sure the adviser managing your money is, too. There are several we endorse, but we're impartial about whether you work with them or not. The important point here is to work with the adviser whose outlook is most closely aligned with yours. Cultivate resiliency. Most Peak Prosperity readers are well-aware of our recommendations here. Start at the individual level to prepare both physically and emotionally so that whatever the future brings, your quality of life is as least impacted as possible. Cultivate community. Whatever your plans, a support network will help you achieve them better, and likely faster, too. Plus, it gives you the added insurance of assistance should your best-laid plans not play out as you expect them to (which happens frequently). Invest in fostering collaborative relationships in your neighborhood, or join existing communities relevant to your location or interests. Defend your income stream(s). Assess your employment situation – how vulnerable is your income? Explore ways to make yourself more valuable to your employer, add additional source(s) of income, and/or create your own business. Steady income makes challenging times much easier to bear by giving you the flexibility to explore different approaches that may work better for the new reality. Without that ability to absorb failure, your options are often much more limited. If you take the above steps, regardless of what happens, you'll be able to sleep at night knowing that you've acted conscientiously according to your convictions. And in the event the bulls turn out to be 'right', few of these steps will serve you poorly. In a secular bull market, hard assets should still appreciate measurably. And personal and community resiliency is always a net positive, regardless of the economic environment. But if the bulls turn out to be the ones in error, the value of these actions could be priceless. So get to it. Do your own personal calculus of the risks. Determine where you need to be positioned. And take the necessary steps to get well-situated where you assess you need to be. It's time to choose a side. I finish each one of these Bear Track rants with a rule; you must first realize that there are, present in our lives, enemies. You must then know who those enemies are and act accordingly. By "act accordingly" I mean get prepared. Be aware of what is most likely to happen, given the circumstances. Be aware of who is responsible. Simply knowing what is about to happen will not be sufficient. Acting on that knowledge is paramount to your having a chance of maintaining an acceptable standard of life for you and your family. The western world as we know it will not last much longer in its' present form. The architects of this collapse will extract as much of the wealth as they can before they finally pull the plug and watch as the nations tear themselves apart from within. Make no mistake, this is a designed collapse and has been planned for decades. Keep in mind that real wealth is made up of hard assets like precious metals, land, production equipment, mineral resources and businesses that produce a physical product. These are the assets that the engineers will take possession of just prior to the total collapse of the affected nations. These are the things that will have value after the collapse and those that have possession of them will make the rules for whatever type of society we find ourselves in. When a country's economy begins to falter, the government will attempt to deflect blame and divert attention with other things. As the government appropriates the last of the nations' wealth and the final destruction of the currency is in sight, many times they will go to war to hide these facts. When inflation begins to enrage in the population the government will invoke price controls to appease the mob, but this will ultimately cause shortages and set the stage for the chaos that follows. Those that believed in the government will be caught unprepared and will be easy to manipulate by those in charge and will be used in many ways. The engineers expect the crisis to end in their favor in some form of tyranny that they control but even the best laid plans never survive the first battle intact. This means they will have contingency plans to deal with the changing tides of chaos as citizens react to government operations. Those that see the signs and prepare for troubling times should have their own contingency plans to deal with changing situations on the ground where they live. The next ten years will be very fluid and you need to be adaptable to survive with your family and resources in tact. The fate of the nation will lie in many things such as who controls the farmland and water resources in the country. These things are mainly found in the rural areas where government resistance will be the greatest. These are things that must be controlled by the government to insure control of the country and its' population. Those who control the food, water and energy will have a great deal of power. The last thing that the powers that are engineering the devaluation of the dollar want to happen is for the world to wake up to the fact that precious metals represent un-inflatable money. Both gold and silver are rising in price. This rise is currently fueled mostly by the dollar's demise. When the resulting "demand panic" kicks in, and it will very soon, the value of precious metals will "go ballistic." It is my view, (and one that is shared by a great many others), that the failure of our current monetary system is imminent. From an economic standpoint, gold and silver will lend heartily to our salvation. Gold and silver will soon regain their positions as the anchors of an honest monetary system. The market will demand it, and the "powers that be" will have no choice but to let the market have its way. The presence of gold and silver in your portfolio will insure that you will emerge from the abyss with your capital intact. There is still time for you to reallocate a portion of your equity into the commodity sector, including gold and silver bullion, and gold and silver mining stocks. This move could well provide you with an unequaled measure of security. The gold standard is part of our Constitutional legacy. The subjugation of the Constitution is the root of all economic evils. If enough of us get together on this, we might be able to "Right the Republic". What will it take? I've been following the price of gold (and silver) for 30 years. I have always wondered – what will it take to get the average American interested in precious metals? What will it take to launch gold into the "parabolic stage" that we haven't experienced yet? What would it take to ignite the awakening? When Y2K arrived I wondered, would this be the spark? It was not. When the stock market bubble popped in late 2000, I wondered, "Is this the event?" It was not. When the real estate bubble popped in 2008, along with the derivatives bubble, I thought, well maybe this time? It was not to be. Backwoods Jack asked me how come the war in Iraq and Afghanistan, Arab Spring, and the Iranian nuclear issue haven't resulted in an explosion in the price of gold. Clearly, they have not. The near-collapse of the PIIGS was, as far as gold is concerned, a non-event. Nor have QE 1, QE 2, Operation Twist and the Fed's announcement that they will keep interest rates near zero well into the future, and that they will purchase $85 billion in mortgage bonds and Treasury bonds every month. So I ask myself, for the umpteenth time, what will it take? There IS a Black Swan event out there that will be the fuse, but trying to predict what it is or when it will occur is futile. The last 30 years has made that clear to me. I can, along with Bill Holter and Andy Hoffman, argue that the end game IS a mathematical certainty. Of that, there can be no rational doubt. What I also know is that since we can't know "what" or "when," we must be early – we must prepare in advance. For those of you who were early, there is comfort in knowing you were not foolish. If you bought gold at $300, or $500, or $750, or $1,000, or $1,250, or $1,500 or even $1,600 – you have done well. The earlier the better! I am as certain as certain can be that those of you who bought your gold at $1,900 will be thrilled with the purchase later this year – or next. It doesn't matter, because this is not a contest to see who can buy at the lowest possible price, because that is impossible unless you are just plain lucky. All that matters is who WINS the game. I say, those who own a lot of gold and silver and very little dollars will be the winners, the big winners. If your only "sin" is being early, you are already ahead of the game. Gold and silver are your insurance policies meant to protect you against the "Black Swan" event that we cannot know in advance. The Swan is out there. I can't help believing that it will pay us a visit sooner rather than later. The fact that I am worried about all of the previous events mentioned above, that did not cause a collapse of the economy, the currency or an explosion in gold and silver is irrelevant. My gains are huge. My portfolio is positioned to survive any Black Swan event. I am not doing it to make a killing. I am doing it to avoid being killed, financially speaking. And meanwhile, my wealth has been virtually entirely in the number one and two performing assets over the last five and ten years. And the best part is, the best is yet to come. The biggest gains are ahead of us. My biggest failing is being too early and it turned out to be a blessing. And all of the above can be said for my readers who have taken my advice. I don't hear any of you complaining of your gains. Anyways, who wants to see things fall apart? Unfortunately, for millions of Americans, things have already fallen apart – as demonstrated by the 24% unemployment number (Shadowstats). That number is something last seen during the Great Depression. You can view the future, the future of the dollar, the economy and the stock market through my prism – or you can view it through the eyes of your money manager, financial advisor or stockbroker. The choice is yours. Apart from being early, I rest on my record! Rising interest rates, causing a collapse in the biggest bubble ever, the bond market. In 1998, the World Bank refused to guarantee a $25 million loan to refinance water services in Cochabamba, Bolivia, unless the government sold the public water system to the private sector and passed the costs on to consumers. Bolivia, one of the poorest countries in the world, finally acquiesced. Only one bid was considered, and the company was turned over to Aguas del Tunari, a subsidiary of a conglomerate led by Bechtel, the giant San Francisco engineering and construction company. In December 1999, before making any infrastructure investments, the private water company, Aguas del Tunari, announced the doubling of water prices. For most Bolivians, this meant that water would now cost more than food; for those on minimum wage or unemployed, water bills suddenly accounted for close to half their monthly budgets, and for many, water was shut off completely. To add to the problem, the Bolivian government, prompted by the World Bank, granted absolute monopolies to private water concessionaires, announced its support for full-cost water pricing, pegged the cost of water to the American dollar and declared that none of the World Bank loan could be used to subsidize water services for the poor. All water, even from community wells, required permits to access, and even peasants and small farmers had to buy permits to gather rainwater on their property. The selling-off of public enterprises such as transportation, electrical utilities and education to foreign corporations has been a heated economic debate in Bolivia. But this was different; polls showed that 90 percent of the public wanted Bechtel out. Debate turned to protest and one of the world's first "water wars" was launched. The people of Bolivia revolted against the government over the privatization of water. A broad-based movement of workers, peasants, farmers and others created the Coalition in Defense of Water and Life to "de-privatize" the local water system. Between January and early February, 2000, hundreds of thousands of Bolivians marched to Cochabamba in a showdown with the government, and a general strike and transportation stoppage brought the city to a standstill. Police reacted with violence and arrests and the army killed six people and injured more than 100 when it opened fire on demonstrators. In early April 2000, the government declared martial law. Could this happen here? Is it possible that you could someday be charged for collecting rainwater off your roof? You would be surprised at how many trans-national companies already have stakes in water delivery in this country. Globally, we have already entered water scarcity. The Middle East will run out of fresh water within the next ten years. Sub-Saharan Africa will run out in the next 5 years. China is considering moving the capital to another location because there is no more water in Beijing. Closer to home, the mighty Colorado river no longer makes it to the Sea of Cortez. It trickles out somewhere in the Mexican desert south of the Arizona border. The Rio Grand, which use to flow into the Gulf of Mexico now stops some 20 miles short of Brownsville, Texas. Aquifers all over the country are being depleted far more rapidly than they can recharge themselves. We are on the verge of a national water crisis right here in America. In the next two decades, the struggle for water will tear apart communities, exacerbate differences between social classes, and challenge governments and private organizations to change how they perceive their roles. When Nolan wrote that song - about a man and his mule in the desert - it's doubtful he knew that he was prefiguring a world to come. Despite the massive abundance of water on our planet (and throughout the known universe, in fact), access to potable water (or a lack thereof) may prove to be the defining social struggle of this century, much like oil in the last. But a plethora of new technologies aim to nip the problem in the bud. Will they be enough? Water is not scarce. It is made up of the first and third most common elements in the universe, and the two readily react to form a highly stable compound that maintains its integrity even at temperature extremes. "Water appears to be one of the most abundant molecules in the Universe. It dominates the environment of the Earth and is a main constituent of numerous planets, moons and comets. On a far greater scale, it possibly contributes to the so-called 'missing mass' [i.e., dark matter] of the Universe and may initiate the birth of stars inside the giant molecular clouds." Oxygen has been found in the newly discovered "cooling flows" - heavy rains of gas that appear to be falling into galaxies from the space once thought empty surrounding them, giving rise to yet more water. How much is out there? No one can even take a guess, since no one knows the composition of the dark matter that makes up as much as 90% of the mass of the universe. If comets, which are mostly ice, are a large constituent of dark matter, then, as Dr. Kotwicki writes, "the remote uncharted (albeit mostly frozen) oceans are truly unimaginably big." Back home, Earth is often referred to as the "water planet," and it certainly looks that way from space. H2O covers about 70% of the surface of the globe. It makes all life as we know it possible. However it got here - theories abound from outgassing of volcanic eruptions to deposits by passing comets and ancient crossed orbits - water is what gives our planet its lovely, unique blue tint, and there appears to be quite a lot of it. That old axiom that the earth is 75% water... Not quite. In reality, water constitutes only 0.07% of the earth by mass, or 0.4% by volume. Oceanographic Institution (©); Adam Nieman. 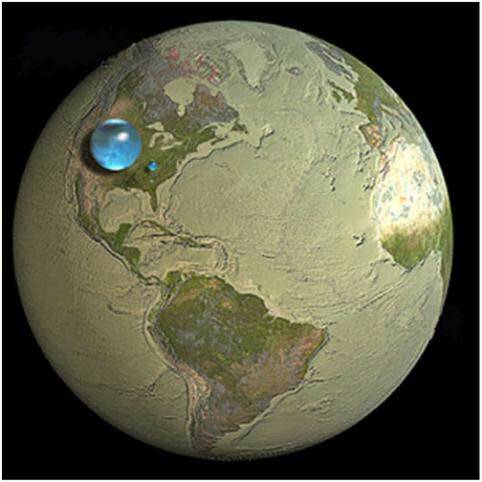 What this shows is the relative size of our water supply if it were all gathered together into a ball and superimposed on the globe. The large blob, centered over the western US, is all water (oceans, icecaps, glaciers, lakes, rivers, groundwater, and water in the atmosphere). It's a sphere about 860 miles in diameter, or roughly the distance from Salt Lake City to Topeka. The smaller sphere, over Kentucky, is the water in the ground and in lakes, rivers, and swamps. Now examine the image closely. See that last, tiny dot over Georgia? It's all the fresh water in lakes and rivers. The Federal Reserve is a bought and paid for group of stooges that act as a tool of the most evil individuals to ever inhabit the Earth. If there is one recurring theme on this web site that I highlight when ever the chance arises, it is to make sure that every warm bodied person that ever peruses the pages of the Bear comes away with the knowledge that the Federal Reserve is the root of all evil in the universe. I have found that no matter how many times or how many ways it is stated, it is never too many. If we all did or level best to rid the world of the Federal Reserve in particular and central banking in general, the world would be a much better place for all of humanity. To make our situation clear, we are living through the largest and most outlandish monetary experiment ever conducted by humans upon themselves. These are extraordinary times, and no matter how many times the mainstream press tries to convince you that a rising stock market or a rebounding housing market implies that we are returning to healthy economic balance, don't fall for it. The Fed is in uncharted territory, having created a monster it can no longer control. In the process, it is blowing new asset bubbles that are benefitting those with first access to the newly-printed money (banks and corporations) at the expense of savers, pensioners, and anyone exercising fiscal prudence. This, of course, is creating a vast and growing inequality between the top 1% and everyone else. The term "currency wars" defines a measure of economic competition between Central Bankers. Almost every sovereign nation has a central bank. In the last week, Switzerland devalued the Franc in order to remain competitive when it comes to exports. The less your currency is worth, the less your exportable goods and services cost in relation to other currencies. On the downside the purchasing power of your average swiss citizen eroded, overnight. This matters not to the host of insiders that either knowingly converted their money into another currency or into gold and silver. Those not on the inside got screwed. Yesterday the same thing happened in Venezuela of a bit more extreme nature. A 46% devaluation! Almost half of the purchasing power of the savings of non insider Venezuelan citizens was stolen from them by their government. For those of you (or your friends that just don't get it) that believe that this couldn't happen here, get ready, 'cause here it comes. CARACAS CONSUMER PRICES ROSE 3.3% IN JAN.
And that, ladies and gents of Caracas, is how you just lost 46% of your purchasing power, unless of course your fiat was in gold and silver, which just jumped by about 46%. "One person who certainly knew how to devalue a currency in real terms was FDR, whose 70% devaluation of the USD courtesy of executive order 6102, was merely an appetizer of what is about to be unleashed upon the US." And, in case there is confusion, this is in process, and coming soon to every "developed world" banana republic near you. (It will happen here).